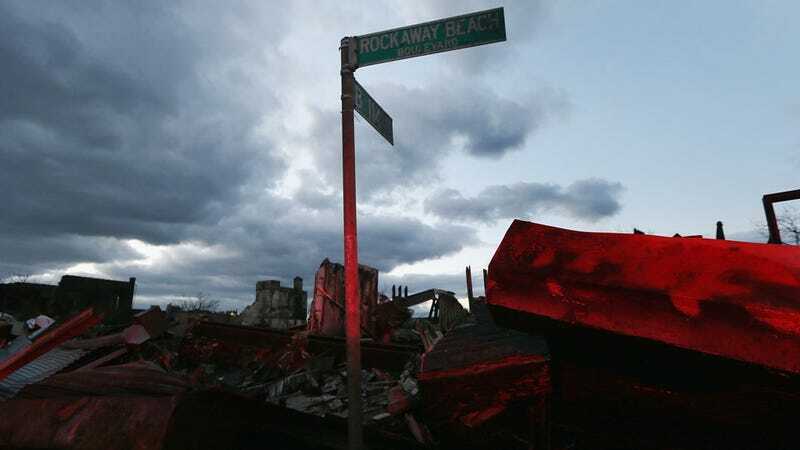 This morning, my coworker Erin and I couldn't stop IMing about this heartbreaking NBC segment about the massive (and, as of now, largely ignored) destruction and rising death tolls on post-Sandy Staten Island. Erin said she thought the video would be a pointless post without information on how people could take direct action by donating and volunteering. "Otherwise, it's just useless gawking," she said. Is that true? The difference between gawking and awareness is something I've been struggling with all week. Many of my friends have biked into downtown Manhattan to explore the black and empty streets: some because they thought it would be cool to drink in the dark, a few who wanted to help friends, most out of a vague, unscheduled curiosity. I haven't left Brooklyn. I've been sitting here at home, feeling mildly disgusted about the concept of walking across the bridge just to look around but also with the alternative that has become my reality: isolation from what's been happening all around me. I'm planning on volunteering this weekend, but not downtown, so I felt kind of gross about going over there to check the situation out for myself. But, as the days passed, I started to feel worse about not seeing it at all. Last month, during a trip to New Orleans, I got into an argument with my friends about visiting the Lower Ninth Ward. I wanted to see what an area I'd read and heard about for years looked like in actual daylight, but some of my friends felt very strongly that it would be disrespectful, hurtful "disaster tourism." I understood where they were coming from conceptually, but their alternative plan involved soaking up the local culture by drinking at a bar. It didn't make sense to me. How was getting drunk more respectful than confronting reality, even as an observer? I think there's a disrespectful way and a respectful way to address most complicated situations, which are rarely inherently either on their own. My friends in New Orleans thought I was making Katrina about myself by wanting to superficially experience the aftermath firsthand. But if you don't make something "about yourself," that is, if you don't process it in your own way, how can it affect your actions? Ultimately, I think awareness is key and more productive than "respectful" distance, even if that awareness begins with watching NBC or biking around deserted streets and doesn't result in direct, instantaneous action. Because the hard truth is that there's an inconceivable amount of suffering around us, all of the time, not just after natural disasters. Hurricane Sandy is a stark, urgent reminder of the economic disparity that plagues New York 24/7. Months from now, when my life isn't in (very slight) disarray from subway closures and canceled social plans, will I remember donating a small amount of money to the Red Cross during a week of blogging from home in Brooklyn, or will I remember what Downtown New York looked like in the darkness? The answer is the latter, even though I've only seen it in photographs - though I'm planning to hop on my bike and remedy that in a few hours.